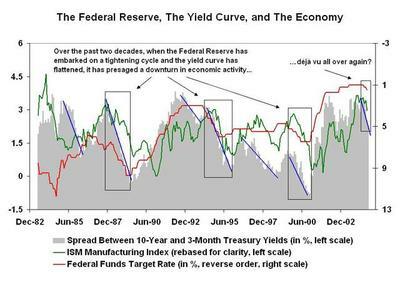 The Big Picture The Big Picture | Did the Yield Curve Send a "False Alarm?" Did the Yield Curve Send a "False Alarm?" "So much for the inverted yield curve." Or so says a recent Bloomberg column. If I read this correctly, any inversion that fails to cause an immediate recession is proof positive that inversions are meaningless, the bond market clueless, and data analysis of little if any value. Therefore, as an economic indicator, this must be declared null and void and immediately disposed of. "Bond yields may have sent a false alarm. The government said today that U.S. employers added 211,000 jobs in March, capping the best start for hiring of any year since 2000. Gross domestic product last quarter probably expanded at a 4.7 percent rate, the fastest in more than two years, a Bloomberg News survey shows. The Federal Reserve is talking about the need to keep raising interest rates to make sure the economy doesn't overheat." "A brief, shallow inversion won't signal any marked slowdown in the economy. Over the past several decades, the yield curve has had to invert by two percentage points or more before a recession materialized." The longer and more inverted an inversion is, the greater the slowdown it forecasts. A short, shallow inversion is a warning; The longer it stays inverted, the greater the impact. There is a nuance to the curve that seems to be getting overlooked. Second, Yield curves do not take place in a vaccuum. The context and other factors involved need also to be considered, such as energy prices. And to reiterate this yet again, one needs to consider at all times multiple variables when analyzing Markets. The context of rising oil prices and inversions is important (see the charts here for more). First, Short interest rates, which reveal the Central Bank's economic expectations. And, second, its a function of long rates, which embodies the Bond Market's economic expectations. "The historical record speaks for itself," said Merrill Lynch analysts in a report published Friday. That's a year later -- not 90 days. If you want to be even more precise, the historic lead time is 40 weeks prior to a slowdown. The data looks fairly persuasive that any inversion is worth noticing, and that a longer deeper one is a broad warning sign that investors ignore at their own peril. Yes, we live in a bumper sticker society, where nuanced is scorned, sound bites rule, and careful contemplation is a rarity. That doesn't mean we all have to succumb to the philistines . . .
i'm not exactly sure if this is related but pretty sure. if you track marshallian k, a measure of excess liquidity, it exploded from mid-2000 (when 2s/10s was inverted) into mid-2003 as the Fed was desperately flooding the sytem with liquidity and devaluing the dollar, trying to stop the japanese style carnage. over the same period Mk exploded, the 2s/10s spread went from -50bps to +260bps. that tells me the bond market was tightening because the Fed was super-easy. since that high in 6/03 when the Fed was finally finished at 1% FF, both Mk and 2s/10s peaked and began to trend lower. there has been a disconnect though, as the 2s/10s spread collapsed while the Mk has stayed relatively elevated, though well off the highs. i think this is why commodities, stocks and real estate also remain at recent highs despite 375 bps of tightening. so now the issue is whether the bond market (or macro hedge funds) eased too much thinking the Fed would choke off liquidity and now is staring at still a weaker dollar and high commodity prices indicating an elevated level of excess liquidity. if this is the case, the yield curve could begin to widen/tighten until the Mk comes back to more normal levels, especially if the Fed stops at 5%, which would put a lot of pressure on asset prices. i think we either get more tightening from the Fed moving over 5% or we get more tightening from the bond market through a wider 2s/10s spread. either way it's bad for asset prices. anyway sorry for the babble, but BR, i'd be interested to see you thoughts on the matter.. bloomberg will allow you to chart Marshallian K (i got by dividing M2/GDP Cur $) over 2s/10s and you can see what i'm seeing.. i might be looking to much into it, but there are too many coincidences to ignore. at worst it's another way of looking at the "conundrum"